ATLANTA…For the first time, journalists from Middle Eastern countries will participate in the annual meeting of The Rosalynn Carter Fellowships for Mental Health Journalism Program held at The Carter Center each year. Fellows from the United Arab Emirates (UAE) and Qatar join the 20th class of fellows in a journalism program which aims to reduce the stigma of those living with mental health conditions. Four journalists from Qatar and two from the UAE will participate in the three-day training along with a group of 10 incoming and nine outgoing fellows from the U.S. and Colombia gathered at the Center to receive training and guidance on mental health fellowship projects. 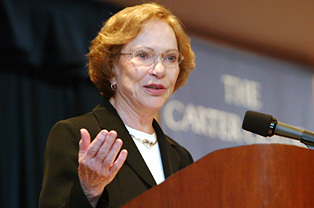 Earlier this year, The Carter Center announced the partnership with Al Jalila Foundation to develop and implement a United Arab Emirates (UAE) Rosalynn Carter Fellowships for Mental Health Journalism (RCJF), the first mental health fellowship program for journalists in the Middle East. The partnership with Qatar Foundation’s World Innovation Summit for Health (WISH) global healthcare community initiative to develop and implement a Rosalynn Carter Fellowships for Mental Health Journalism program in Qatar was announced in June 2016. Over nearly two decades, the Center has awarded one-year fellowships to 181 journalists to connect them with resources and experts to enhance their ability to cover mental health issues around the world. The program is currently in the United States, Colombia, Qatar, and the UAE and was previously in New Zealand, South Africa, and Romania. The Carter Center will provide trainings, educational materials, mentorship, evaluation tools, and technical expertise to develop a sustainable and tailored program in both countries. Al Jalila Foundation and WISH will manage the program in each country and be responsible for the selection of journalists, facilitating media trainings, and adapting the program to meet the needs of the local journalists. Topic: Examine the topic of depression and its prevalence in Arab society in an attempt to establish a culture that is supportive and equipped with responsive and adequate treatment. Topic: Encourage open discussion about mental illness in the UAE through anonymous support group meetings and a monthly newspaper column. Topic: Explore the difficulties faced by caregivers, and the need to provide them with a strong support system, whilst raising awareness amongst the public on Dementia. Topic: Investigate the mental health consequences on working mothers, focusing on the effects of care work, or unpaid work, within state policy and its impact on work- family balance. Topic: Examine the plight of those with mental illness in some of the world’s poorest countries and the plight they face with stigma and discrimination. Special focus is placed on a growing number of community projects aiming to help them. Topic: Explore the possible options available to refugees for matters pertaining to mental health issues with an emphasis on the affected individuals from the Middle East and Africa. Information on the program and the 10 incoming fellows for the 2016-17 year may be found here.